Interested in Skype harmonica lessons? I teach over the Internet using Skype, a free program which allows us to see and hear each other, live, in real time, from any location in the world, using a webcam. An alternative to Skype is Google Hangouts, which is a similar free video chat service available to anyone with Gmail or a Google account. If you’d like to get started, please give me a call at (603) 762-9378 or email me through the Contact page. It’s just like an in-person lesson. I’m sitting in front of you, you’re sitting in front of me. You ask me questions, I answer. I play something for you on the harmonica, you listen, then play it on your harmonica. I give you feedback. There’s a slight time delay, which prevents us from playing simultaneously, but call-and-response works fine. You may want to have some scratch paper available to take notes by hand, and I’ll email you PDFs or text documents for songs and exercises, which you can either view on-screen during the lesson, or print out. I also have begun creating my own MP3 jam tracks for students, which allow you to practice playing songs and jamming with acoustic guitar accompaniment, just like we would in person. I’m in New Hampshire, on the east coast of the USA, so my time zone is the same as New York City (Eastern Standard Time). For folks outside the US, my time zone is GMT -4, -5, or -6, depending on Daylight Savings. Please be sure to let me know your region and time zone when scheduling lessons. I mostly teach Monday – Thursday from 10:00am to 7:00pm. If your time zone makes those hours inconvenient, let me know and we’ll find a time that will work for both of us. I accept payment online via Paypal. You can either pay using your own Paypal account or a credit card. You don’t have to have a Paypal account yourself, that’s just how I process the transactions on my end. 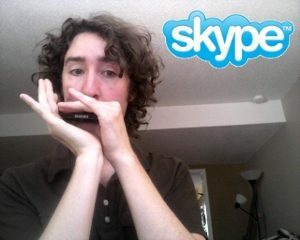 My rates for Skype harmonica lessons are $50 for an hour, $35 for a half-hour. Click here to purchase lessons. I’m told that Skype works over dial-up, but it’s not great. You’ll get a smoother picture, better audio, and fewer dropped calls if your home Internet connection is high-speed. Most laptops and netbooks come equipped with webcams now, but if you don’t have one, they’re available at Staples, Wal-Mart, or online, starting around $30. Click here to browse some webcams. Skype is free to download, install, and use. Just head over to the Skype website, click on “Get Skype,” choose your operating system (PC, Mac, or Linux), download and install it. Once it’s installed, you’ll start it up, create an online login using your email account, test your webcam out, and you’re ready to go. My Skype ID, by the way, is taddreis. Your webcam will pick up your voice, and you’ll be able to hear me through your computer speakers, but it can be helpful to wear headphones to hear more clearly. Earbuds or headphones used for normal music listening will work fine. Oh yeah, having an instrument would be helpful, wouldn’t it? I recommend using a Hohner Special 20 in C.
To use jam tracks in a lesson, you’ll need a speaker dock or portable boombox, along with an MP3 player or CD with our jam tracks.